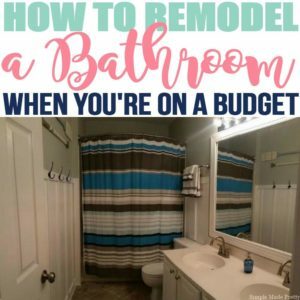 Renovating a home can come with a high price tag if you’re not budgeting and deciding which updates bring the best return on investment. After selling our updated first home in just 4 years, we bought an even bigger house that needed a lot of updating. We plan to sell our second home after 4 years while doing the much-needed work to produce a profit by following the same strategies we did in our first home. 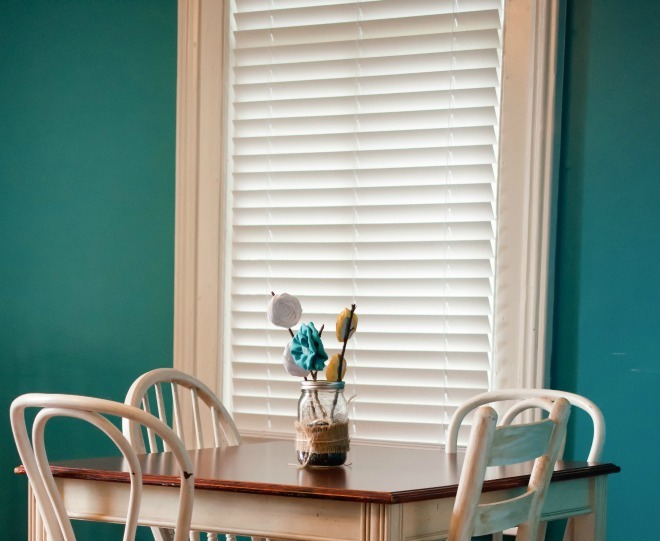 If you enjoy updating your home, want to increase your home value or just want your home to look better, here are 10 Cheap Home Hacks That’ll Make Your House Look So Much Better. 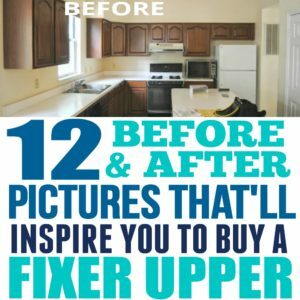 ✅ This specific hack to update your home is the most popular with my readers. 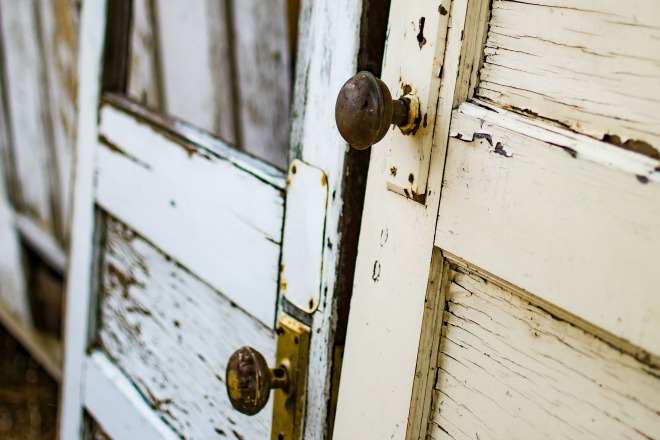 The first thing we like to do when buying a new home is changing the door handles on the entryway doors. This ensures only you have the keys and you can opt for a universal key lock. Updating doorknobs throughout the house is a bit time consuming but it provides a few benefits for an ROI. It also creates consistency throughout the home. 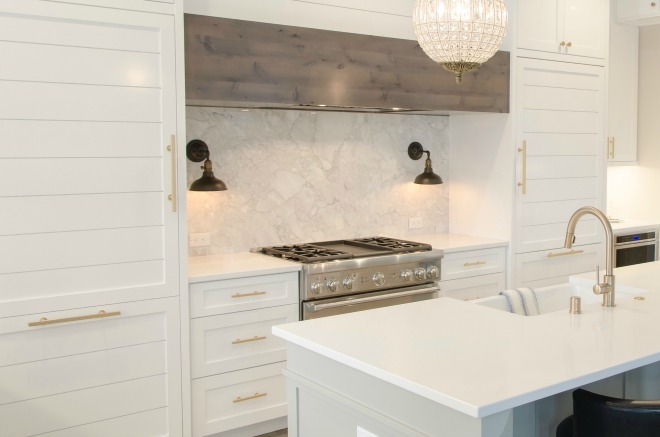 Not only will all the hardware on the doors match, but you can match ALL the hardware throughout the home (faucets, cabinet knobs, light fixtures etc). I recommend picking one type of hardware and keeping it consistent throughout the house. ✅ We updated our home with doorknobs from this company and they were super cheap and offered fast shipping! Updating electrical outlets and light switches is just as time-consuming as changing door knobs but brings an easy ROI. Updating electrical outlets helps you keep consistency (same look and color throughout the home) and allows you to update old or non-compliant outlets. 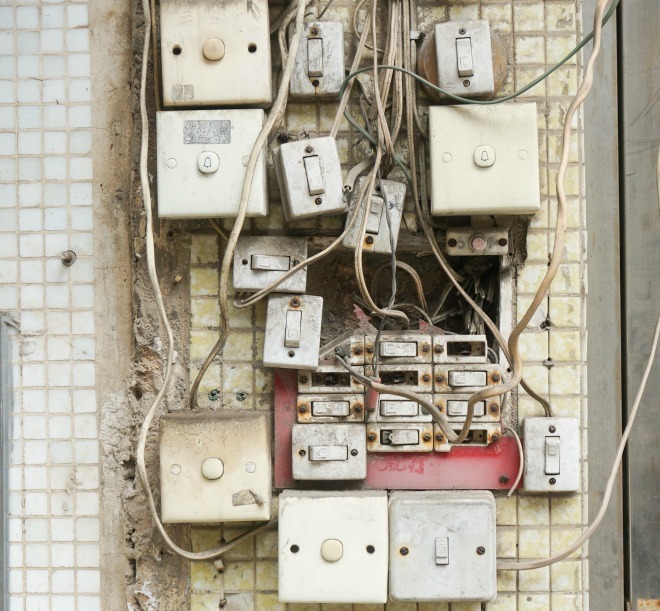 If you aren’t familiar with how to change an electrical outlet, check out YouTube or take some classes to learn the proper safety for electrical work. I changed my first outlet recently and although it was easier than I thought, I’d rather the hubby stick with tasks like that since he is a lot more experienced than I am. ✅ These electrical outlets are easy for beginners to replace, but if you want to add more function, these get great reviews and offer 2-day shipping. Painting is the easiest way to update any space in your home. You can paint the walls, ceilings, trim, baseboards, cabinets, built-ins, and furniture to improve the look of your home. Paint supplies are minimal and can drastically change the look of your home. Be sure to check out my popular post, How to Choose Interior Paint Colors and 7 Amazing Bedroom Paint Color Combos for inspiration! ✅ These specific paint colors are the most popular with my readers. 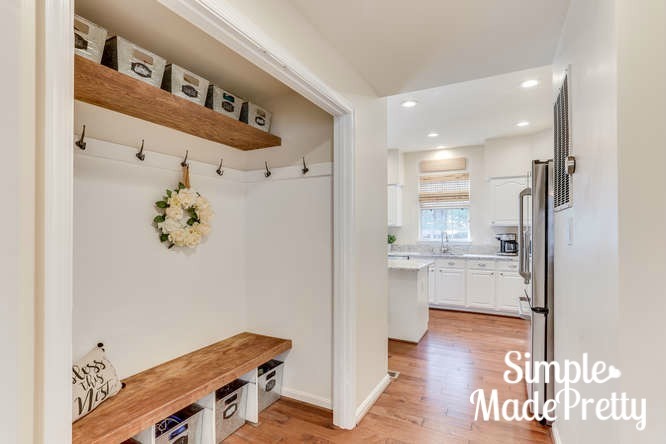 Adding simple molding or framework in your home takes little effort and creates dimension to a room. We added a chair rail to our dining room to make it look more formal and a molding frame around our builder grade bathroom mirror to give a finished look. If you have basic builder grade cabinets and drawers, chances are they don’t have hardware other than the hinges. Depending on your choice of hardware and number of cabinets, the cost is minimal with a high ROI. Adding hardware to your kitchen cabinets will instantly update the room. ✅ I highly recommend hardware from this company which is super cheap (but high quality) and offers fast shipping! One of the first projects we completed in our second home was to update the light fixtures. We installed recessed lights in the kitchen and main level hallways. Then we updated the dining room chandelier, the breakfast table pendant, and added a beautiful chandelier in the stairway. We replaced the ceiling fan light fixtures in the family room and the master bedroom and the lighting in the bathrooms. Each light fixture replacement cost anywhere between $50-$150 each but completely updates each room. Bonus if you can match your hardware and light fixtures. 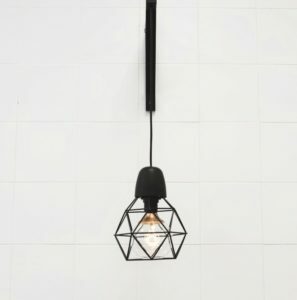 ✅ We purchase light fixtures from this store, which is offers classic, modern, and farmhouse style lighting options. Window blinds and curtains in many homes are usually neglected. At least, in both of our homes, they were awful when we bought them. In our second home, the blinds were torn apart and falling off the windows. There weren’t any curtains on a single window. Blinds can be expensive depending on the style you choose, but curtains can be cheap to make or find at your local thrift store or Ikea. We eventually replaced all of the blinds in our home and added curtains to every window. 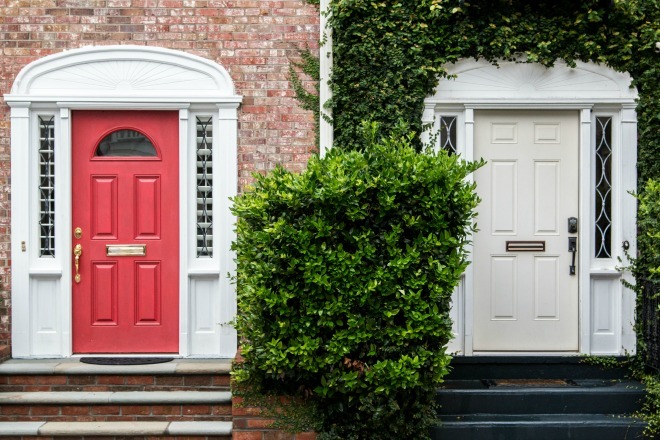 Paint can transform even the smallest spaces, like your front door. Our front doors and shutters were hunter green when we bought our house. We immediately painted them a matte black and it made our home look much richer. We also replaced the front door handle and metal kick plate to match. If you have a storm door, replace the hardware and investigate if you can paint it (or replace the whole storm door if you can afford it). Updating sink and shower faucets ties into updating the rest of the hardware in the home. Try to keep the color/metal consistent with faucets, lighting, door handles, and cabinet pulls. When we bought our second home, both shower handles were broken and needed to be replaced (I’m not sure how the previous occupant showered!). 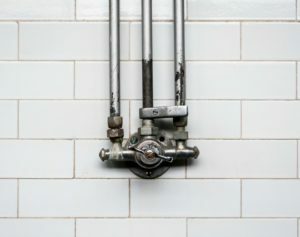 Sink faucets cost between $25-$200 depending on how fancy you want them to look but otherwise are an easy, affordable upgrade. Lastly, if you want your home to look better, decluttering every room works wonders. If you’ve ever been on the home buying side, you’ve probably seen a few homes that were “staged” with minimal decorations or personal items. Those are the homes that tend to sell the fastest. If you desire to have a better-looking home, try reducing some of the items in your home and it will make a huge difference! If you need help getting organized, grab the Simplify Your Home in 30 Days cheat sheet bundle! Download this CHEAT SHEET bundle to help you declutter, organize, and simplify your home in 30 days! 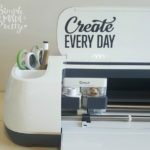 The bundle includes 21 pages of printable forms, cheat sheets, and checklists to help you FINALLY get organized. 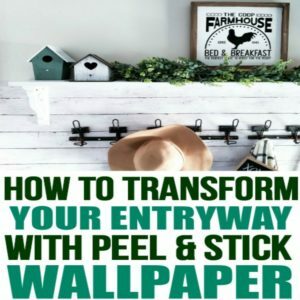 You can find peel and stick wallpaper online at Target, Amazon, Home Depot, and more! Updating your home with peel and stick wallpaper might be faster than painting. If you need help getting organized, grab the Simplify Your Home in 30 Days cheat sheet bundle! 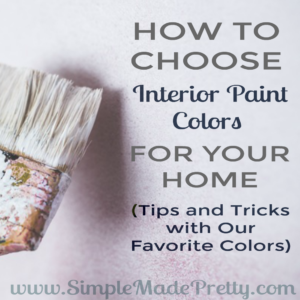 ✅Be sure to check out this popular post, How to Choose Interior Paint Colors for more inspiration! First I love your ideas. They are a simple way of improving the look of a home without having to do a major renovation. Second I only mention as a safety note: When doing anything with electrical make sure you a) know what you are doing (have some training) and b) please make sure you turn off the breakers. So many people have been hurt or killed because they thought it was an easy job but was out of their know how range. 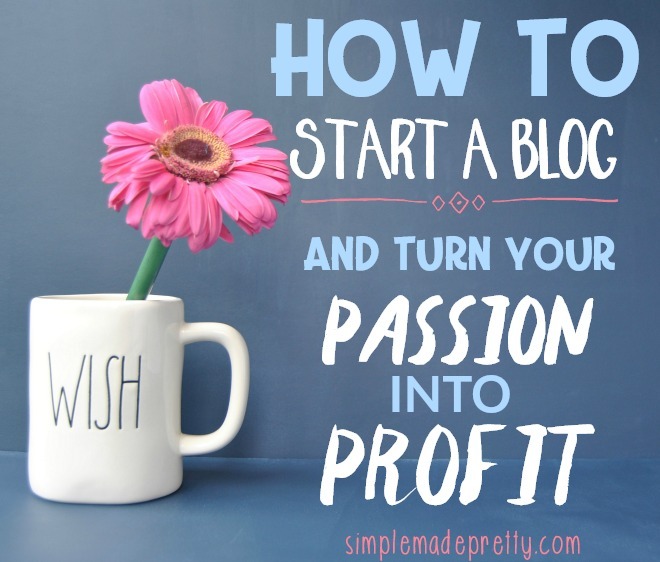 But again other than safety I loved all of your ideas so simple and easy even if you aren’t going to sell your home. Melanie your home is just amazing! I must say, it doesn’t look cheap at all. It comes off as one of those classy and expensive fixes. One major problem for me is decluttering. We don’t have storage units in our country, so it’s quite hard to figure out where to put the things we don’t really use but don’t want to sell or throw away. Hopefully I’d figure something out soon. Thanks for the great share! That hardware looks so easy to install and has a beautiful look to it! We have been thinking about replacing ours. These are great. Your house looks so beautiful.